Once upon a time in the snowy forests of Finland, there was a girl named Hanna who knew only her father, his training, and their simple cottage. When she came of age, Hanna decided it was time for her to see the outside world. Hanna sees Morocco, makes her first friend, and packs the morgue with baddie bodies. 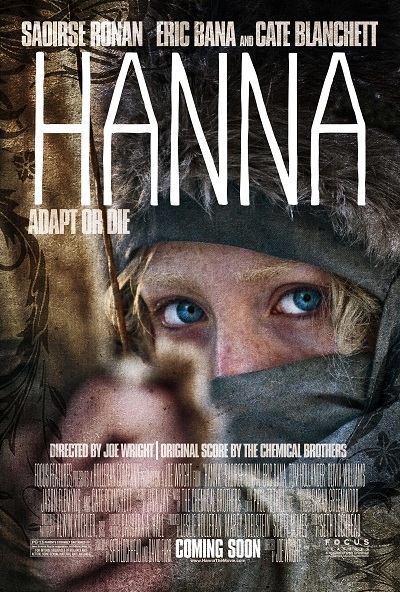 Hanna‘s coming-of-age concoction of violence and innocence (via sad broken playgrounds and killers whistling kid tunes) is sure to make it an instant classic, next to Leon:The Professional and Unleashed (aka, Danny the Dog). The screenplay by Seth Lochhead and David Farr is a three course meal, serving amusing appetizers, delivering a dramatic duck (with slice of lemon), and action à la mode. The fight sequences, though at times confusingly close, recall the first Bourne film (sans the shaky cam). One scuffle in particular will have you holding your breath, as it uses the long take to build tension rather than just to show off Hanna director Joe Wright did in his previous film, Atonement. Such methods speak to Wright’s maturation as a director. During the opening sequences he utilizes dynamic shot composition with fluid movements to introduce the audience to the relationship between Hanna and her father; yet he can appropriately shift into faster cuts and stylistic flourish when chases ensue. But these action pieces don’t stand alone by the choices of the director and editor, as they’re invigoratingly guided by the pumping themes of The Chemical Brothers. The duo lights the fuse and runs, letting their beats and the onscreen beatings marry into a pulsating crescendo that will get your blood moving. If it weren’t for the development of Hanna as a real girl and not just a killing machine, Hanna would quickly fade into obscurity once the ad team walks away. But by showing Hanna’s introduction to the real world (not telling it) and having Saoirse Ronan to play the lost child, Hanna ensures there won’t be an apathetic audience. Supported by Eric Bana as Hanna’s father and Cate Blanchett as the enigmatic menace Marissa Wiegler, the whole film takes off. *And don’t worry gents, the film didn’t alienate this male viewer. Boys have The Goonies, The Sandlot, and The Monster Squad. It’s about time girls get some badasses on their side. This entry was posted in Filmsmith Faves, Reviews and tagged Cate Blanchett, Eric Bana, Hanna, Joe Wright, Saoirse Ronan, The Chemical Brothers. Bookmark the permalink. I’m glad you liked it, I was wondering. I’d read two really good reviews in Rollingstone and Spin Magazines, both giving it just a half star short of their perfect score. Then the A.V. Club review gave it a C+ so I was wondering. I think the A.V. Club tend to be overly critical sometimes, but I still read their reviews.